Mark Lombardi, PhD, has served as president of Maryville University since 2007. In that time, Maryville has achieved unprecedented growth and earned national distinction for leading an exciting revolution in higher education. Dr. Lombardi is the tenth president named since the institution’s founding in 1872. Since his 2007 inauguration, Dr. Lombardi has provided visionary leadership for Maryville University. 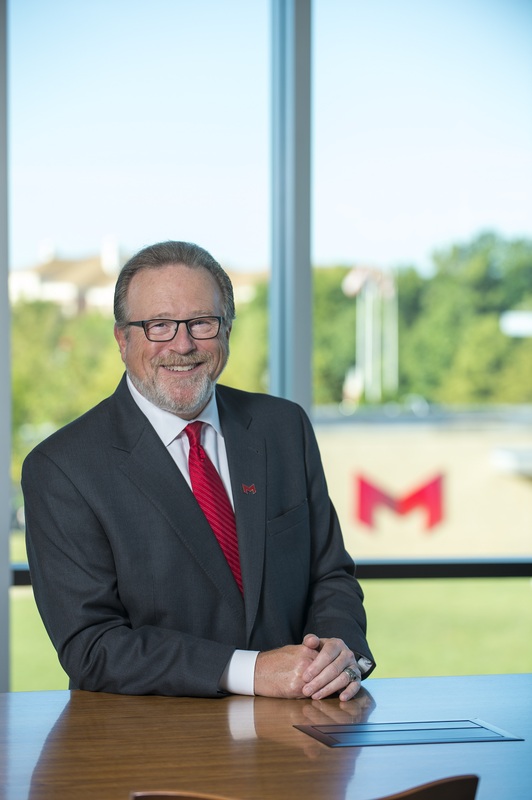 Nationally, he is recognized as a thought leader in the higher education revolution and is frequently called upon to address Maryville University’s significant advances in educational access, technology, partnerships and developing an individualized path for students to learning and success. He is also co-author of the recently released book Pivot: A Vision for the New University(2019). During Dr. Lombardi’s tenure, enrollment at Maryville University has tripled to over 9,300 students, hailing from 50 states and 60 countries. U.S. News and World Report has named Maryville the third fastest-growing private university in the nation in 2017, and in 2013 and 2014 named Maryville the #1 Overperforming University in the United States. In addition, Maryville has also been ranked in the top 15 percent of universities nationwide for ROI three consecutive years. Five academic programs are now ranked nationally, and 97 percent of Maryville graduates have a job or enroll in advanced education programs within six months of graduation. The University has continued to develop strategic partnerships with corporate entities such as Apple, Salesforce and Pearson. For 30 years, at three different institutions, Dr. Lombardi has served as a faculty member, department chair, director of international programs, vice president for Academic Affairs, provost and president. He has also served as executive director of the U.S.-Africa Education Foundation. Dr. Lombardi has significant teaching experience in U.S. foreign policy, U.S.-Soviet relations, African politics and global issues. He was a tenured full professor at the University of Tampa and he was awarded an honorary doctorate by the board of trustees of the College of Santa Fe in 2007. Dr. Lombardi has also given over 200 interviews in print and video media on issues ranging from US foreign policy to the future of higher education. Dr. Lombardi earned his doctorate and master’s in political science and international relations from The Ohio State University and his bachelor’s in political science from Purdue University. His published works include three books: Taking Sides: Clashing Views on Global Issues (tenth edition); The Unfolding Legacy of 9/11; and Perspectives on Third World Sovereignty: The Post-Modern Paradox. Dr. Lombardi was recently elected chair of the St. Louis Sports Commission and is a member of the Board Of Governors NCAA Committee on Diversity and Inclusion as well as a longtime participant in the NCAA Pathways program. He currently serves on the Great Lakes Valley Conference Council of Presidents (Chair, 2013-2017). Previously, he served as a board member with The Lifelong Vision Foundation, Boys Hope Girls Hope, Wells Fargo, the Executive Committee of the Santa Fe Chamber of Commerce, Rotary, the Foreign Affairs Council and the US-Africa Education Foundation.